Eureka Forbes, which is one of the major manufacturer of Home Cleaning & water purifying products, now launched Euroclean Vacuum Cleaner with World’s First 3D technology. Now they are offering a chance to get information and demonstration of the Euroclean product. You can get it absolutely free at your Home. WHAT LOOKS CLEAN, MAY NOT BE CLEAN. IT’S TIME TO TAKE A CLOSER LOOK AND WIPE OUT DUST MITES AND ALLERGIES. Just follow the below steps to get free home demo. 3. Now verify your mobile number using one time password. 6. 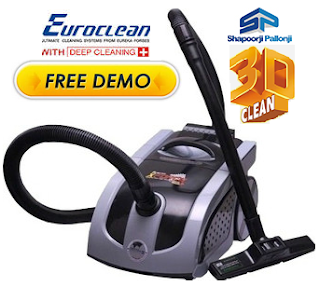 Soon a Euroclean Vacuum Cleaner executive will contact you to arrange free Home Demo. 3D Clean : Your house has millions of dust mites that cause severe allergies. Dusting and swabbing are absolutely ineffective as they just remove visible dust and dirt. They need more than traditional cleaning. Disinfection of the cleaned surface.